In identifying binding constraints to growth of member-countries, the IDB and many other multilateral banks have adopted the Hausmann-Rodrick-Velasco methodology. In principle the methodology is relatively straightforward: by looking at all the possible constraints to private investment–the main driver of growth of a country–in comparison to its peers, one should come up with one or two critical constraints to economic growth. In practice, however, the methodology seldom yields ‘priorities’ because almost every issue can be shown, in some context or another, to be a major constraint to growth: poor physical infrastructure, lack of skills, difficulty setting up a business, macroeconomic instability, high cost of finance, market failures, governance problems, etc. Let’s find one developing economy that does not have these problems. In practice, it is impossible to make a certain and fool-proof case that the 2-3 constraints identified are indeed more important than the others. How does it work for advanced countries? The OECD has been looking at the issue of measuring and understanding productivity for a while, albeit with the benefit of enormous amounts of high-quality data and studies. However, the process has been developed, standardized and more importantly, implemented every year so that it is useful in comparisons across time and across countries. This is synthesized in the annual publication, ‘Going for Growth’ which not only gives a broad overview of comparative indicators of growth but also provides a starting point for discussions with policy-makers in member countries about the 2-3 key productivity constraints. This is exactly what the Caribbean needs: a systemic and thorough analysis of the productivity drivers, as well as a road-map for engaging in meaningful discussion with the country regarding priorities and strategies. 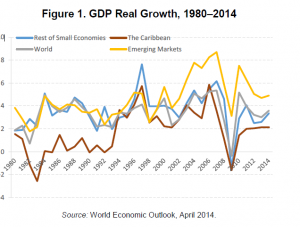 In the Caribbean Growth Forum meetings, there are discussions of these growth-promoting policies, but no good ways of measuring productivity and its determinants. In order to set up such an exercise, however, some basic data collection would be required for the production structure indicators, much of it administrative data. 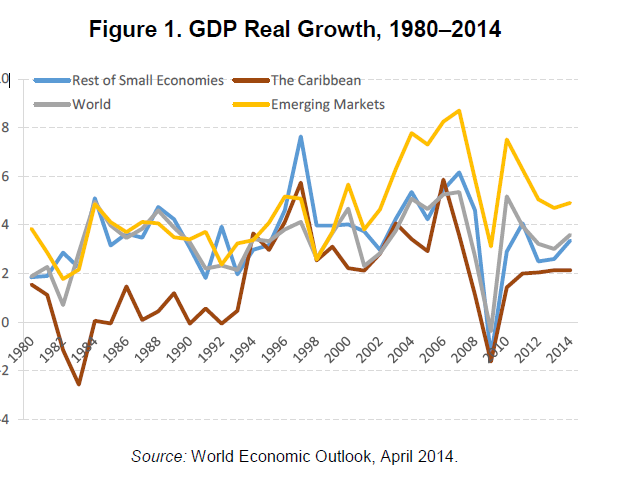 A recent policy brief ‘tropicalized’ the OECD methodology to the IDB-member Caribbean countries and conducted some similar exercises linking economic growth to performance and policy variables. Once that is fairly well set up and published, the Caribbean Country Department could consider incorporating into its consultation process the results of the benchmarking exercise to discuss with governors (at the regional level) and even linking them to the OECD exercise. Moreover, the country exercise would be the basis of the discussion of policy priorities during the annual programming missions. Maybe not all countries are amenable so one could just apply it to one or two at first. Who knows, one could also do this exercise for the Pacific Island economies and broaden the comparison further with the Caribbean.